Currently browsing posts filed under "Joe Cruz ’91"
Here’s something for ephblog. 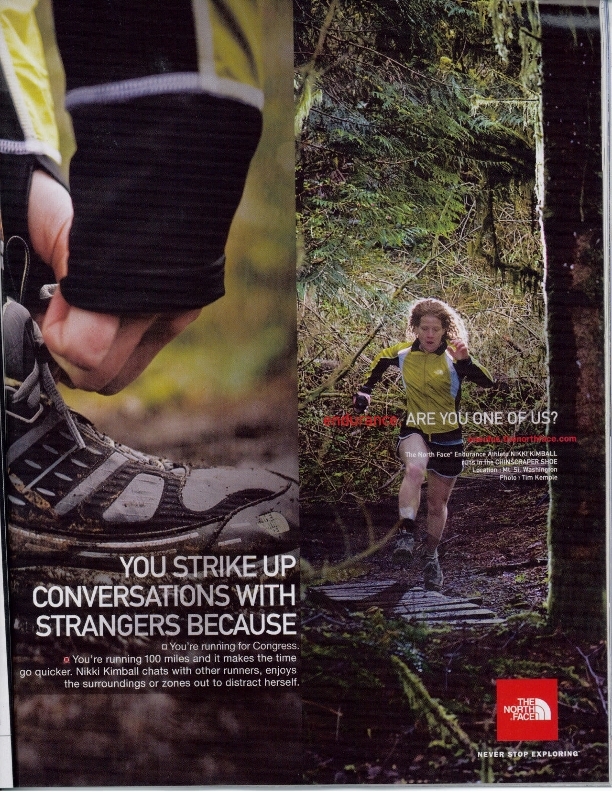 I spotted the attached scanned add in a recent issue of National Geographic’s Adventure Magazine. Nikki Kimball — the athlete depicted — was class of ’93. Indeed, I was her JA. She was, then, as she apparently is now, a first rate athlete in addition to being smart and a successful scholar. Thanks Joe and congratulations to Nikki! This message came in to EphBlog Central 4+ years ago. We have a lot to catch up on! Professor Joe Cruz has served on the Board of EphBlog for a number of years as our link to the faculty and the campus. For this dedication, and the patience, forbearing, and belief in the potential of EphBlog that this dedication must have required, we thank you, Professor Cruz! On a much more personal level based on my time with the Board, I would like to thank him for his continued input and support for the steps taken since October, 2008 to start EphBlog on a path to realize a more moderate position as perceived by readers and potential readers. And in particular, a discussion with Professor Cruz, Sophmom, and me concerning the need for the disclaimer currently prominent on the masthead proclaiming EphBlog ‘Your UNofficial source for All Things Eph’’. This long-needed separation was approved by the Board shortly thereafter. EphBlog desperately needs the input of students, parents, faculty and other members of the extended Williams family if it is to rise above being a somewhat mean-spirited blog of those to whom argumentation and long-winded diatribe are a life-essential. Thank you, Joe Cruz, for your years of input towards helping us on the journey to achieving this. I am a big fan of anonymous grading. If you want to be fair to your students (and to be perceived as fair by them), there is just no excuse besides laziness or tradition for insisting on knowing their names when you evaluate their work. I am pleased to see that Professor Joe Cruz agrees. Grading on all writing assignments will be anonymous. Please turn in your papers with only your Williams ID number on it in some unobtrusive place. Anonymous grading is one way of assuring that the collegiality of our interactions does not cloud my assessment of your work. Grading blindly is not a perfect mechanism for this purpose. One crucial disadvantage to anonymous grading is that the instructor will not know when your work is systematically inadequate and will not approach you with concerns about your writing. As a result, there is an additional burden of maturity and responsibility on your shoulders. You must elect to visit office hours, to discuss your work with the teaching assistant, and to seek out informal opportunities to improve your writing. 1) Have any of our readers had experience with anonymous grading at Williams or elsewhere? 2) Do many (any?) other professors at Williams do the same? If not, why not? And, lest I be accused of sucking up to Joe, I’ll note this old-fashioned exhortation. For this course you will write FOUR essays, 5-6 pages each (7 maximum, strictly enforced). Page counts! Come on, Joe. Kids today are experts in font selection and margin adjustment. They can turn 1500 words into 4 pages or 8 pages or anything in between with ease. If you really want the essays to be a specific length, then you need to assign a word count and require students to put the word count on the front page. Now, to be fair, Joe does specify that “Essays should be typewritten, double spaced in a 12 point font with 1 inch margins.” But, in an age of word-counters in every editing program, it seems that a word count would achieve Joe’s goal in a much more straightforward fashion. It is also the standard method of measuring length in other publishing domains. The Hume tutorial is underway and we are having a splendid time. The students who are keen to participate in Ephblog’s presentation of the tutorial have asked that I be the host of their work. Thus, I’ve mounted Laura Specker’s first paper and Noah Susskind’s first paper on my server space. Let me say something about how I envision the tutorial assignments. Firstly, we are placing equal emphasis on the written work and on the oral presentation of ideas during the supervisions. It is my sense that oral presentation is a sorely undernourished skill at Williams, and I hope that the tutorial program can go some away toward remedying that. Secondly, the reading assignments of my syllabus sit somewhere between now-traditional Williams tutorials and tradition Oxbridge supervisions. That is, I do assign particular readings — the primary text — for each week, and I urge that students concentrate on these. I also make available a reading list from which I expect students to draw ideas and themes for discussion. The books on the reading list are on reserve in Sawyer (since we don’t wish them to be checked out for very long), but the journal articles must be tracked down by the participants in the tutorial. This, I hope, will give them a taste of doing archival research. In the best cases, students will then use the references in the books and journal articles to track down additional secondary literature. Indeed, this has already happened, as Noah showed up yesterday with a collection of papers , Reading Hume on Human Understanding: Essays on the First Enquiry, edited by Peter Millican (Oxford, 2002). I will shortly send some material from the critical remarks made during each of our two meetings. Incidentally, in a common error, you’ve listed the title of Hume’s book as A Treatise ON Human Nature rather than A Treatise OF Human Nature. Thanks to Joe for the correction. Instead of participating in our discussions on Anthony Marx, motivated readers should check out these papers and provide some comments here. What is the most exciting educational innovation at Williams this spring semester? Easy! Newly tenured professor Joe Cruz is teaching a tutorial on David Hume’s Treatise on Human Nature. What’s different this spring is that two students have volunteered to have their essays posted on the web. We will be linking to them from EphBlog and, perhaps, commenting as well. Sceptics will claim that no one cares, that no one could possibly be interested in what a couple of undergraduates have to say about Hume. Maybe. These sceptics also doubted that thousands of readers would regularly come to EphBlog, that our virtual Winter Study seminar would attract dozens of participants and that hundres of people would find (portions of) senior theses like Jen Doleac’s ’03 and Lindsey Taylor’s ’05 worth reading. Sceptics are always sceptical. I think that the sceptics are wrong, that there is a huge demand from alumni and others for greater participation in the intellectual life of the college, that current students would enjoy and appreciate alumni involvement, that these demands will increasingly be met via the classroom and that tutorials form a natural starting point. I predict that, in a few years, we will all be able to listen in on one of Joe’s tutorial sessions and even, someday, to watch as well. You read it here first. Long time readers will recall that EphBlog tried something similar three (!) years ago. Perhaps this attempt will work out better. There has been an explosion of comments on Professor Joe Cruz’s blog on WSO in response to his initial post. Noah Susskind’s is my favorite. This probably has nothing to do with our post on the topic here. The real question, for we denizens of ephblog, is how can we convince Professor Cruz to join us in our efforts. Advantages for him would include the wonder of Movable Type — including html, notification for comments, and other goodies — along with a more diversified readership. Disadvantages probably include fewer initial readers for each new post; many more people see the WSO main page each day that come to ephblog.com. Then again, the appropriate comparison is how many people click through to his blog on WSO versus how many come to ephblog. Long time readers will recall that we made an attempt to get into the on-line philosophy business last fall. Perhaps it is time for another try. EphBlog is powered by WordPress and delivered to you in 0.895 seconds using 35 queries..